We've seen how recessions can be categorised as epidemic or pandemic. But those experiencing recessions have to undergo several emotional stages that will tax their resolves to the limit. This is true at the individual as well as at the macro level. Such stages are similar for those being depressed at the loss of their livelihoods as those facing terminal illnesses. The stages have been well documented in the form of the grief model by Dr. Elisabeth Kubler-Ross in 1969, in her book On Death and Dying. The model shown here essentially contains five stages though this chart - taken from Booz & Co's Strategy & Business website - shows eight. The five key stages are: denial, anger, bargaining, depression and acceptance. As I've argued earlier, this recession is a pandemic recession or more correctly, a Grand Depression, much worse than the Great Depression of the 1930s. Most people still are convinced that the worst is now over. This is not surprising since they are mostly still at the denial stage. If you look at the chart, moving from the denial to the next stage, anger, is very difficult. The emotional response climbs from a low steady state to an agitated level. It's certainly a big hurdle to pass. This refusal to face reality prolongs the recession. 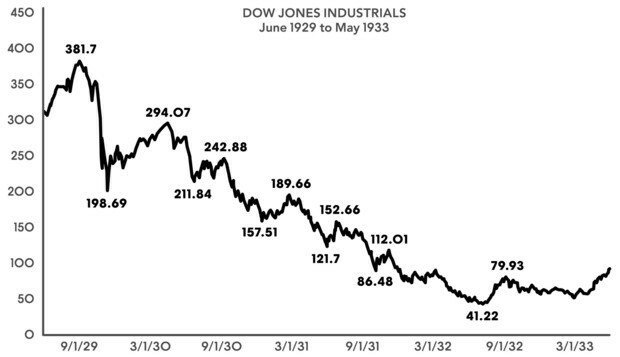 In fact, if we look back to the Dow Jones Industrial Average (DJIA) during the depression years 1929-1933 (see chart below from Bloomberg), we can notice that there are several rallies, seven as counted by some commentators, on its way to the bottom. The pattern is also obvious, everytime it went down, it tried to move up but every upward movement had less momentum than the preceding one. But one thing is clear, each year it closed lower than the bottom of the previous year. At its peak on September 3 1929, the DJIA topped out at 381.17. Within three years, it slumped to 41.22, just over 10% of its peak closing. In the spring of 1931, they were also talking about green shoots. But these shoots wilted when the Austrian bank, Creditanstalt, then the largest bank in Central and Eastern Europe, collapsed in May 1931. Creditanstalt was not a run-of-the mill bank; it was controlled by the Rothschilds. The collapse triggered a global meltdown. Before that, it was thought the economic crisis was confined only to the US. Likewise, today the widely held view is that the crisis is caused by the US subprime loans. That's just the early symptom; the real crisis is global excess capacity. No country will be spared. It's a matter of when. Its severity will be certainly very grim. This crisis will over time disconnect the leaders of many countries from the led, each with diametrically opposing views of themselves and on the future economic outlook. The leaders and policymakers are imbued with narcissism, smug and confident that they have the means to end the recession. In the Kubler-Ross diagram, they are at the denial state. If they manage to hang on to office, in due course they will cross the anger state. At this point, their politics of consensus and inclusion gives way to one of polarisation. Fortunately, during the last wave, the anger could be directed to the war in Europe. Now the US is too powerful for any nation-state to pick a fight. The anger has to be dealt with internally. The next two stages, depression and acceptance, are beyond the reach of the leaders because they would have been booted out at the anger stage. We would be witnessing frequent changes of leadership as voters become more dismissive of their leaders. The man in the street buffeted by prolonged unemployment and weighed down by heavy debts, can no longer be reasoned to. He has reached the point of nihilism, a result of their anger, rejecting everything just for rejection's sake. President Obama will have tremendous obstacles pushing new initiatives, be they healthcare or defence buildup in Afghanistan. The odds are stacked against him succeeding. With no recovery in sight, the mood of the unemployed will grow angry and, for those that have progressed to the advanced state, depressive. Anger fuels increased crime and violence. The depressed may succumb to suicide. The internal breakdown of the American society will be on a much larger scale than that wrought on Iraq and Afghanistan. The government needs to provide support for volunteering and self-help work that provide outlets for the unemployed to occupy their time and utilise their energy. This encourages their move to the acceptance stage. Everyone must accept the reality that in an environment of excess capacity, there are simply no more new jobs. Only then can we move quickly to the acceptance stage. But we know that this is not going to be; instead, anger and depression - the state of both the mind and the economy - will be the order of the day.